The interment control form for Will Johnson (1889-1942). Interment cards are control forms for burial lots in national cemeteries. They provide the details of name, rank, serial number, unit(s) and war(s) served in, discharge, death, interment date, gravesite, and next of kin when possible. 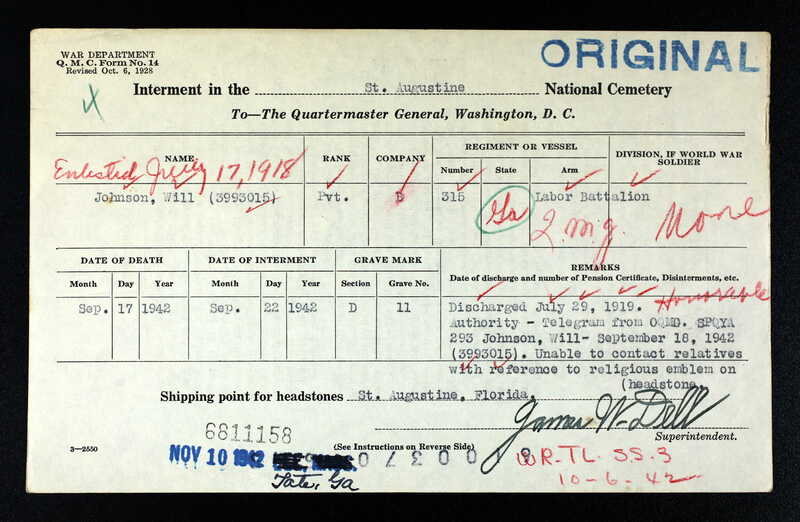 According to his card, Johnson served in World War I as part of the 315th Labor Battalion, was discharged on July 29, 1919, and died September 17, 1942. His next of kin was unavailable, and his religoius mark for the headstone could not be determined. 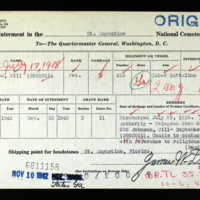 Digital reproduction of original typewritten interment control form by James W. Dell, September 22, 1942: Office of the Quartermaster General, Record Group 92. Originally created by James W. Dell and published by the Office of the Quartermaster General. Dell, James W.. “Interment Control Form, 1942.” RICHES of Central Florida accessed April 19, 2019, https://richesmi.cah.ucf.edu/omeka/items/show/10372.